Announced on October 6, 2015 at Microsoft’s event in New York City, the Surface Book is the first 2-in-1 laptop ever built by Microsoft. The new device features a 13.5-inch display with 267ppi, and has backlit keys, and PixelSense for touch. Inside, the Surface Book is sporting the latest NVIDIA GeForce GPU, GDDR5 RAM, and a 6th-en Intel Core Skylake Processor. Microsoft says the Surface Book will offer 12-hours of battery life per charge and claims their device is twice as fast as Apple’s MacBook Pro. A definite surprise of the event — which also included the likes of the Surface Pro 4, Lumia 950 and Lumia 950 XL — the Surface Book took grand honors with wow-factor as it was really the only total surprise of the event. While it was rumored that a larger Surface was on the way, no one expected something of this caliber. Microsoft’s first 2-in-1 laptop/tablet is a big one. The Surface Book isn’t your average laptop however, it has some pretty insane specs — and Microsoft claims it is twice as fast as Apple’s MacBook Pro laptop. The 13.5-inch device has a detachable, full-size keyboard with and integrated trackpad, and the 10-point multitouch display only adds to the fun. You can use the Surface Pen to get down to the nitty gritty as well. The Surface Book does have some resemblance to the Surface Pro 4, but it definitely packs a punch when it comes to power. It’s sporting Intel’s latest Skylake processor, so you know it can take nearly whatever you throw at it. Without the keyboard, the Surface Book is a powerful tablet Panos Panay described the separated Surface Book as a ‘digital clipboard’ on stage, based on an A4 sized piece of paper. When split, the tablet portion sports around 3 hours of battery life, but the rotational fulcrum hinge will allow you to use the Surface Book in multiple positions without separating it from the primary battery. Weight as laptop: Non-GPU: 3.34 lbs., GPU: 3.48 lbs. Weight as tablet: 1.6 lbs. Microsoft will be offering five different configurations of the Surface Book, with the base model offering 128GB SSD, 8GB of RAM and an Intel Core i5 processor for $1499. A step up will get you a 256GB SSD along with 8GB of RAM and Intel’s Core i5 for $1699. For $1899, you can get the discrete GPU, 256GB SSD, Intel’s Core i5 and 8GB of RAM. For the Core i7, pricing starts at $2099, which comes with a 256GB SSD, 8GB of RAM and dGPU. The top of the line model comes in at $2699, which offers 512GB SSD, 16GB of RAM and the discrete GPU. 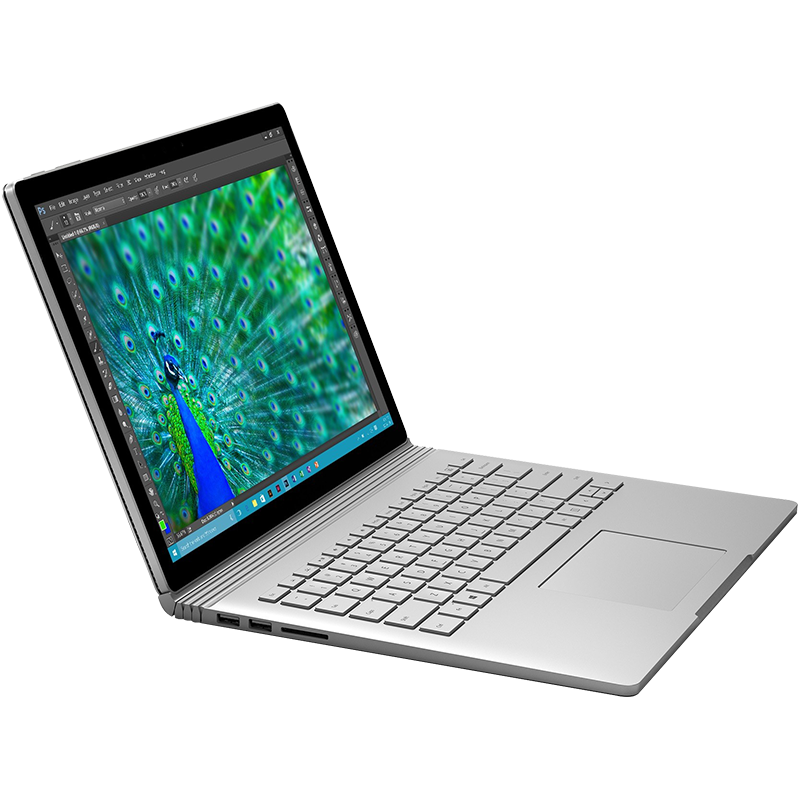 The Surface Book was made available to the masses for purchase on October 26, 2015. If you're going away to college and you want to take an amazing laptop with you, grab yourself a HP Spectre x360, or one of our other picks of best laptops for students. If you're still rocking the original Surface Book, a fresh batch of stability fixes is now available with the device's latest firmware update. Attracted to the MacBook Pro but want something a little more Windows-y? Your best bet is to get a Surface Book 2. Which Surface Book would you choose? Microsoft has two Surface Books out with the latter generation sporting a more recent Intel processor and some other additions. The original Surface Book can be found at a discounted price, so which would you choose? The Apple flame has died out for some fans of the Cupertino company who are now looking for alternatives. Here are seven reasons why now is a good time to upgrade to a Windows PC. Have you checked the settings using the Surface app? Also, check your Bluetooth settings. A fresh batch of stability updates are rolling out to the original Surface Book and the new Surface Pro. We've been Surface users since the dark days of RT, but with the Surface Book 2, it looks as though Microsoft might have achieved perfection. Here's why. The ultimate laptop is back with a vengeance, rocking high-end GPUs, quad-core processors and much more. Here's how the new 13.5-inch model stacks up against its older brother. When it occurs, disabling/enabling the "Intel(R) Precise Touch Device" (under Human Interface Devices in Device Manager) does get it to work again.